The fall of 2018 was a challenging one meteorologically for conducting some fishery management activities. After all, a large portion of fisheries biologists’ daily duties takes place outdoors (Yes!) and, somewhat perversely, most don’t mind working in adverse weather and actually find it “relaxing”. To a point. Trap netting efforts in Maine this year, which began during the end of September, were fairly uneventful other than viciously windier than normal conditions on the water. Nothing we’d never dealt with during normal day to day working situations though. However, mid-November quickly turned abnormally snowy and cold and brought a few extra challenges to our annual Nesowadnehunk Lake trap netting operation. Originally a planned four-day effort, in which the Enfield Hatchery crew would arrive on the fourth day to strip eggs from captured female brook trout to incubate and raise for future trout stocking efforts. There was a layer of half-inch shell ice when we launched our boat on the first day, but no ice in the areas we set the nets. Then things turned interesting. Overnight temperatures plummeted and a snow storm moved in, while launching the boat on the second day in even thicker ice with slush on top, our hopes of this being a four-day operation evaporated. The day quickly turned into an icy, snowy scramble to capture enough brook trout before the air temperature again dropped enough to prevent the hatchery from successfully spawning them. Oh, and as an added incentive we really didn’t want the slush-ice, which now spread to one of our net locations, to freeze our nets in place! Providence was with us, we captured the bare minimum number of female brook trout we wanted for the number of eggs needed. 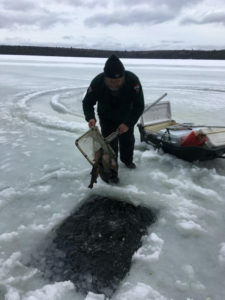 Despite the swirling snowstorm, temperatures held just above freezing and the crew from Enfield Hatchery was able to strip the eggs, though in less than ideal conditions lake-side. Getting one of the nets free from the slush-ice was a time-consuming, laborious task that was a new experience for all and will forever be linked in our minds to the 2018 Nesowadnehunk Lake trap netting operation. The historically cold temperatures did not let up and created more challenges in late November. Fish stocking access was hindered throughout the region by unplowed logging roads and ice covered ponds. One pond in particular, Flatiron Pond in Cedar Lake Twp., was to be stocked with fall yearling brook trout but Mother Nature caught up with the hatchery’s busy stocking schedule. Deep snow covered every possible route in to the pond and Flatiron became inaccessible to the stocking truck. In most circumstances we would have suspended stocking until next year, but this is the winter where we had planned to evaluate the stocking program and conduct aerial angler counts. Two opportunities that would not come around again for several years. We quickly hatched a plan to use snowmobiles and tag sleds to haul coolers full of brook trout to be released in the pond. This was a first for us, using snowmobiles to stock fish. After breaking a trail from the closest plowed road to the pond we were ready to meet the stocking truck to load up with fish. Ironically, the bitterly cold November weather worked in our favor this time. Temperatures had been so cold all November that a covering of solid, seven-inch black ice had formed on Flatiron Pond and we were able to drive our snowmobiles onto the ice which saved us from having to hand-carry all the fish from shore. After cutting a sufficiently sized hole in the ice we stocked 220 brook trout which will provide a great ice angling opportunity this winter. Those are just a couple examples of challenging environmental conditions fisheries biologist sometimes encounter. I’m not complaining however, as a wise, retired fisheries biologist often said (usually during the worst of conditions) “we have the best job in the world”. 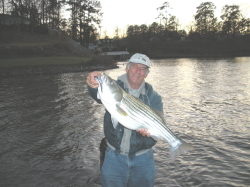 This entry was posted in Fishing Tackle on January 15, 2019 by ronniegarrison.